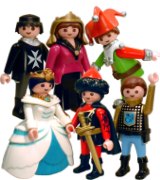 Playmobil® is known all over the world for producing toys with a very high standard of quality. Many years ago, the Playmobil® factory in Malta used to throw away their factory rejects at a dump which was also used by the general public. Quite often the figures found their way to market stalls where they were sold at very cheap prices. 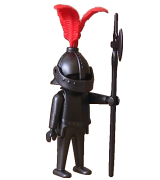 When Playmobil® discovered this illegal trade they imposed fines on the sellers which gradually brought it to an end. Imperfect figures are much harder to find now, but the collector with a keen eye will occasionally discover such a piece at a car boot sale on the island, where people sell their own personal collections. However, sometimes these figures actually make it into the packages. Again, these images may not be appropriate for all our visitors... so, enter at your own risk. If you have your own special klickies and would like to share them, please email us about it.